Each Wednesday, Mario’s South Side Saloon plays host to Team Trivia. Last week, we went for the first time and had a blast. We didn’t win, but if we did, our pre-trivia meal would have been covered, since the first place receives Mario’s Gift Certificates. Before trivia, I feasted on one of the burgers, the Cow Tipper. 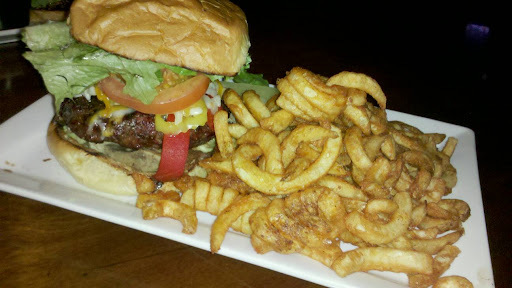 The cow tipper is a hamburger with avacado, red and banana peppers, cheddar and mozzarella cheeses. Despite not being asked how I wanted my burger cooked, it turned out medium-well. The burger was thick and difficult to get your mouth around, but each bite got a little of every ingredient for a consistant meal. I wish the avacado would have been on top of the burger instead of under it, because it left the bottom bun soft and mushy. The curly fries were a good choice for a side, especially seeing the sweet potato fries were soft and greesy (how, I don’t know). In the end, I was pleased and learned that I need to see more movies in order to compete in Team Trivia.